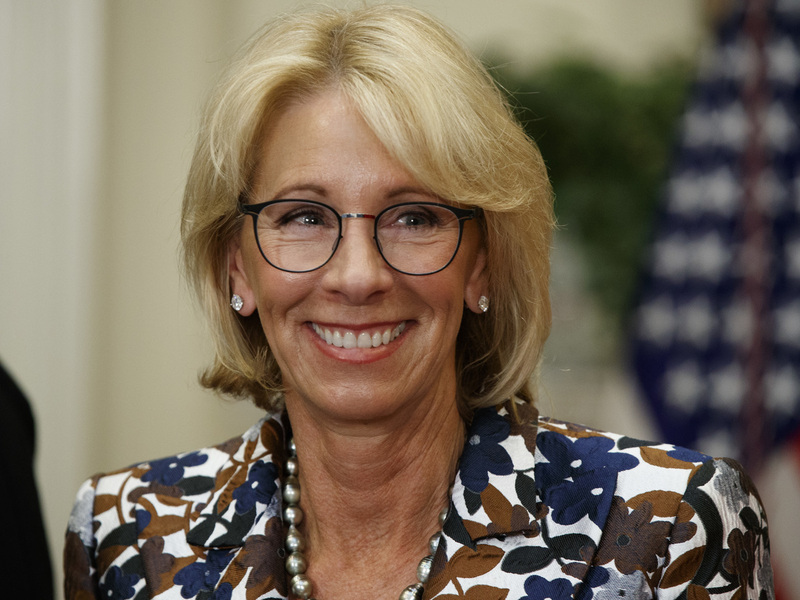 Education Secretary Betsy DeVos Commencement At Bethune-Cookman University Draws Protests : NPR Ed There is an outcry over the secretary of education's invitation to speak at the commencement of a private, Christian, historically black college in Florida. Education Secretary Betsy DeVos during a school choice event at the White House earlier this month. Fifty thousand signatures on protest petitions. Calls on the president of the university to resign. People on Twitter saying they're mailing back their degrees. It's probably not what the leadership of Bethune-Cookman University was expecting when they announced their speaker for today's commencement ceremony. But Education Secretary Betsy DeVos seems to bring a unique level of controversy almost everywhere she goes. And that's especially true when it comes to historically black colleges like Bethune-Cookman. Earlier this year, DeVos called HBCUs "real pioneers when it comes to school choice," a remark she was forced to walk back after protests; in fact, these colleges were founded as the only option for students, when other colleges were still legally segregated. Just this week, DeVos found herself clarifying comments by President Trump that seemed to suggest that a key form of funding for HBCUs might be unconstitutional. In announcing the invitation last week, Bethune-Cookman's president, Edison O. Jackson, said DeVos' "mission to empower parents and students resonates with the history and legacy" of Mary McLeod Bethune, the college's founder. Trinice McNally holds both a bachelor's and master's degree from BCU. She said that she and many other alumni "were outraged" both by the invitation and by the allusion to Bethune's legacy. "It's a complete insult. There is no comparison." Rachel Gilmer is with the Dream Defenders, a Florida-based progressive-leaning youth organization that is among the many groups on and off campus organizing against DeVos. "This is a person who's planning to privatize our schools. They're planning to gut many of the steps taken to protect student borrowers by Obama ... she has made it clear in her words and her actions that she doesn't care about the futures of black people." BCU did not immediately respond to requests for comment from NPR. The school has been active on social media, posting a picture of empty cardboard boxes on Twitter with the hashtag "#Deception?" — presumably referring to the petition drive — and posting a video on Facebook Live. On the same day that it announced DeVos, May 1, the university released a second announcement in response to the widespread blowback. This time, President Jackson invoked academic freedom. "I am of the belief that it does not benefit our students to suppress voices that we disagree with, or to limit students to only those perspectives that are broadly sanctioned by a specific community." "Graduation is a really big deal for our kids and for their families," as the grandmother of one Bethune-Cookman graduate commented to the website Politic365. "That spotlight should be on them and not on the controversy of the speaker that has been invited." Her name? Evelyn Bethune. She's the granddaughter of the college's founder. Organizers would not say whether any disruption of the speech is planned Wednesday. Dream Defenders and other groups are using the hashtag #BackstoBetsy online. "I hope they take a stand," McNally said of the new graduates.